Had such a good time with Grunge and the gang yesterday... figure why not continue along as he trudges his way through S.A. Land (that's Sequential Art land to us mere mortals). 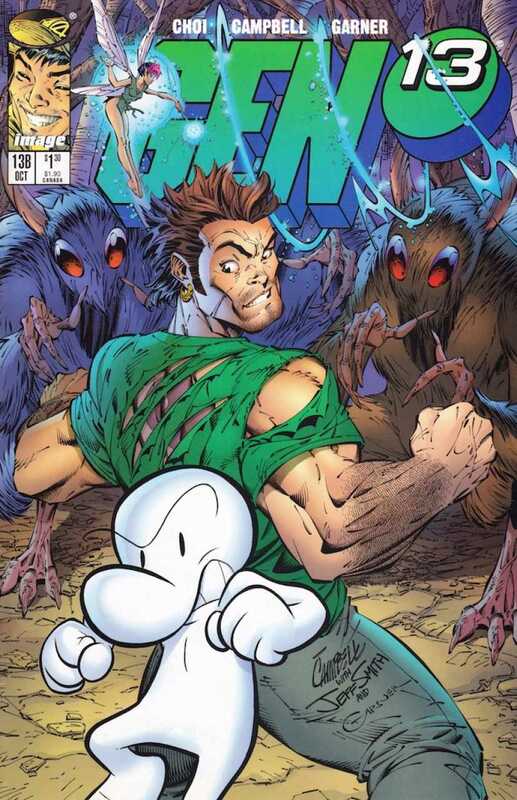 Is that Bone on the cover? We open with Grunge on his merry way to the Valley of the Dolls when he stumbles across a pile of Teenage Mutant Ninja Turtles merchandise... and, well I'll be damned, the Teenage Mutant Ninja Turtles themselves! Grunge helps them get back on their feet, and they give him a sob story about their current status, and how they wish they could go back to being comic book heroes again. They give Grunge the hot tip on the whereabouts of the Great Wizard, and send him through the Frenzy Beast's path of wreckage. Grunge and Tink follow the path in to the Scary Forest where they come across Fone Bone being roasted on an open fire by one of the Stupid Stupid Rat Creatures. Tinker Fall buzzes around the rat's face, and Grunge kayos him with a wicked left hand. Here Grunge learns that his Gen-Factor Powers are not active in the Land of S.A. Bone decides to accompany Grunge on his way to the Valley. The pair (and Tink) wander past a fountain, and Grunge decides to eat some of the "tasty looking beans" that are floating in it... yeah, that sounds like something you definitely wanna do, Grunge. Well, the grossness of eating found floating beans aside, these buggers are actually living breathing citizens of Beanworld! Grunge spits'em out and 'pologizes. Our traveling pals continue into Image Land... or maybe it's Image Town... the sign changes between panels. This is where Bone splits off from the group. We get a pretty neat bird's eye view of the town, and see that it is broken up into disparate little fiefdoms... one for each Image founder's imprint. At a glance I see Top Cow, WildStorm, Erik Larsen's head, and whatever the hell Rob Liefeld was calling his imprint at the time... either Extreme or Awesome. We get our first in-town cameos here as Savage Dragon tosses both Wonder Woman and the Hulk out of the Highbrow Club. Grunge wanders past the Top Cow barn, and notes that it is deserted. I think this was around the time of Shattered Image, where Silvestri was going to leave Image... but ultimately wound up staying... and by the time the Shattered Image (4 issue) miniseries wrapped up, they'd kicked out Liefeld. Whatta mess. Speaking of Liefeld... there's a notice of eviction on his fiefdom... and some very Liefeldian gritted-teeth characters are quite displeased with the proceedings. In the background we see some of Rob's garbage... including an overpriced Badrock suit and a copy of... get this, Young Crud. Poor Rob... this is some cold-blooded spoo. Grunge continues on until he gets to Wildstorm Castle... inside the (miniature) DV8 heroes (remember them?) run up to Grunge and ask if he's their daddy. They tell him that Dr. Frankenlynch is in charge, and is the only one that can help him find the Wizard. Grunge heads up a long flight of stairs to meet up with the Doc and his henchman Leegor. Yup... Spawn. Spawn tells Grunge that the Wizard has already left to do battle with the Frenzy Beast. He sees something in Grunge, and feels that he may be the right man to help free the Land of S.A. from the Beast... but he cannot go alone. Why, only a Madman would choose to go along with him... good thing we got one'a those! Don't get me wrong... I thought a lot of it was fun... but even I, who's been reading comics for upwards of three decades, have to say... this was perhaps a bit too "inside baseball". I couldn't imagine a reader today picking this up and getting even half of the references in here. You've almost gotta have a working knowledge of everything Image... and a stack of Wizard Magazines of the day next to you to have even half a hope of grasping this. Very navel-gazy. Speaking of Wizard... they keep mentioning a Great Wizard... ya don't think... nah, they wouldn't. Would they? That may be the only way they could "date" this any further... man, I hope that's not the direction this is headed. We've already gotten a Jim Lee cameo, I sure don't wanna see Gareb Shamus's mug! I will admit I did chuckle at the Liefeld slights... but I'm kind of ashamed that I did. Seems like such a "kick a dude while he's down" kinda thing to do... especially if he and Jim Lee were working together on the Marvel Heroes Reborn event together. The comics cameos were pretty great here... really quite surprising that they were allowed to cram all that graham in here. Makes me miss the days that comics were less "corporate". This kind of thing wouldn't/couldn't happen these days lest we taint Disney or Warner's pending movie IP's. Overall a completely insane issue that was a ton of fun to read. I know I said that the previous issue may not appeal to everyone... I think this one might just for the sheer novelty of seeing all of these characters together. If you're not a 90's comics kid, don't expect to get all the in jokes... hell, even if you are of that era you probably won't! This one shouldn't be too terribly difficult to track down at a decent price. If you come across this (or any of the #13's) give'em a look through. We'll wrap up the "13 Trilogy" tomorrow... I gave it the ol' flip through... we're in for some ridiculously crazy stuff!